Perhaps one of the most interesting pieces of architecture in Akron's downtown is Inventure Place. The courtyard in front of the sail-like structure actually enters the building several levels above the bottom floor. 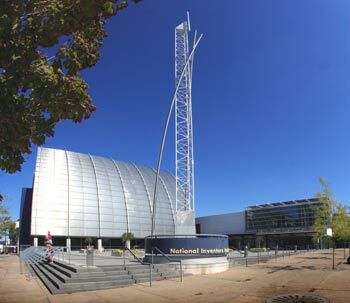 From the top floors, which contain the Inventor's Hall of Fame displays, you can see all the way down to the bottom floor, which holds several interactive exhibits. The Inventors Hall of Fame was established in 1973 by the National Council of Patent Law Associations, now the National Council of Intellectual Property Law Associations, and the Patent and Trademark Office of the U.S. Department of Commerce. Wed - Sat 10:00 a.m. - 4:30 p.m.